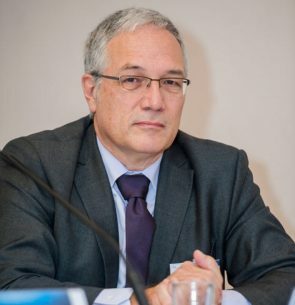 Prof. Dr. Udo Helmbrecht is ENISA’s Executive Director since October 16th, 2009. Udo Helmbrecht was appointed after making a statement to the European Parliament and replying to MEPs’ questions on 16 April, 2009. ENISA’ s Managemnet Board nominated him from a list of candidates proposed by the European Commission, following a presentation of his visions. In September 2014 ENISA’s Management Board decided to extend the Director’s term of office for five years. Prof. Helmbrecht is assisted by a Permanent Stakeholders’ Group and ad hoc Working Groups on scientific and technical matters. Prior to his appointment, Udo Helmbrecht served as the President of the German Federal Office for Information Security, the BSI, for six years, during 2003-2009. In 2010, Udo Helmbrect was bestowed with the title of Honorary Professor at the Bundeswehr University in Munich.